Ed listened to the six o’clock news on the booking officer’s small radio. The reporter described him as remorseless, a cold-hearted murderer. He slumped in the hard plastic chair, cuffs pinching his wrists. According to the reporter, Ed’s twenty acres was a killing field containing “massive piles of dog carcasses and bones clearly visible from the air.” She described from her helicopter scorched patches in the dirt yard and obvious mass burial sites. She made his property sound like a war zone. For thirty-five years he bred hunting dogs and disposed of retired greyhounds. For twenty dollars a dog Ed saved an industry millions of dollars a year, maybe billions. This was illegal? “It’s just a business,” he mumbled to the booking officer. What he did was no secret. People always looked the other way, pretended he wasn’t doing it. They wouldn’t adopt them, wouldn’t fund the “rest home” proposed by the shelter and the dog track. He did for the dogs what he could. They didn’t look at him any different when he fed them than when they saw him with a gun. Greyhounds are like that. None of the breeders had come to his defense yet. He’d been here for five hours, breathing in the manufactured cool air in the booking room, the funky foot odors in the holding cell, and whatever waited to assault his lungs in lock up. Ed clamped his mouth shut. 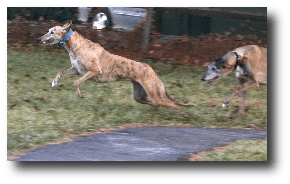 Randy raised greyhounds. He was a successful breeder and adopted retired dogs right out of his office. He understood Ed’s business because he cared about the dogs. That reporter and all the others like her were phonies. They spoke up when they had a cause that was easy to get behind, or popular. They didn’t get behind the hard work. Self-righteous and cowardly. This boy in his uniform with his gun strapped to him and a badge on his chest didn’t understand. Not everything kind always has a light shining on it. Sometimes it’s dark and unpleasant. Ed was sure the boy, that reporter and everyone else still believed kindness had to feel good. They were too wrapped up in their own sensibilities to see the truth in what Ed had to do for the dogs. He had five large runs back of his house. He cut away a tunnel of trees between the runs and the bay, so that the breeze off the bay would funnel through the trees right onto the dogs. They got out four times a day to do their business and twice to run. They had a clear three acre pasture to themselves. The dogs would race each other in great circles around the field, then roll in the grass. Stretched out on their backs in the sun, they gave off happiness. He’d keep them for two weeks, just like the shelter. If no one called with a home lined up, he’d shoot the group. He’d burn them in a sheltered field on the other side of the property separated from his house and the runs by an acre of trees. He kept the death smell of the killing field far from the dogs. They died one at a time with his hand on their haunches and the gun at the back of their head.. He was careful about the dogs’ happiness in their last days. They deserved a pleasant retirement and he gave it to them. There was always a new batch of dogs right behind them. “Can I get some water?” Ed asked the officer still immersed in punching stuff about Ed into his computer. Lots of rules, yes. Few made much sense to Ed. Don’t steal. Don’t murder. Be kind. Be honest. These were all the rules we needed. Most of the rest were just people trying to make sure those dumber than themselves understood how these rules worked in different situations. Made things more complicated. Gina Sakalarios-Rogers lives in Pensacola, Florida where she is an instructor of composition and creative writing at the University of West Florida. She received her M.A. at UWF and her Ph.D from the Center for Writers at the University of Southern Mississippi. She has published fiction in Toasted Cheese, The Bare Root Review, and Dispatch Litareview. She was nominated for a 2006 Pushcart Prize and was voted a notable story of 2006 in StorySouth Million Writers Award.